Paddock Wood is a small town and civil parish in the Borough of Tunbridge Wells and county of Kent in England, about 8 miles (13 km) southwest of Maidstone. At the time of the 2001 census it had a population of 8,263, falling marginally to 8,253 at the 2011 Census, and is the centre for hop growing in Kent. Paddock Wood has three tiers of local government: parish, borough, county. Since 1974 Paddock Wood has formed part of the Borough of Tunbridge Wells. The borough is governed by a 48-member council. The town elects 4 borough councillors, with 2 each for the Paddock Wood East and Paddock Wood West wards. They are all members of the majority Conservative Party. The upper tier of local government is provided by Kent County Council. The county council has 84 members, with each representing an electoral district. 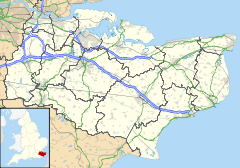 Paddock Wood forms part of the electoral district of Tunbridge Wells Rural. The commercial areas of Paddock Wood are separated by the railway line. To the South of the railway lies Commercial Road which runs north east to south west through the town, and is the main shopping street. At the north east end of the street is the entrance to the Railway Station. Commercial Road is home to the branches of several banks, a variety of take-aways, a restaurant and a number of small shops. To the east of Commercial Road, runs Maidstone Road. This road runs north to Beltring and East Peckham, and south to Matfield, and is the main route into and out of the town. To the north of the railway line lie the industrial areas. Eldon Way Industrial Estate can be found to the east and is home to British Car Auctions, among others. To the west is the larger Transfesa Road and Paddock Wood Distribution Centre. This is the home to a number of companies including Gabriel Chemie UK Ltd, Norman Collett, CoolChain, Mack Multiples, Warburtons and a Whirlpool warehouse, which was destroyed in a large fire in early July 2005. Mascalls Gallery, a public art gallery opened in 2006 on the site of Mascalls Academy. It had a frequently changing programme of exhibition featuring national and international known artists. These included Henry Moore, LS Lowry, Graham Sutherland and Lee Miller as well as artists from Latin America, Japan and America. In 2010 Mascalls Gallery exhibited for the first time in the UK drawings by Marc Chagall for nearby Tudeley Church. The Gallery has since closed, because priorities at Mascalls have shifted, as they have nationally. In 2012, the first recorded outbreak of Asian long-horned beetle in the UK was found at Paddock Wood in Kent, near small commercial premises that had imported stone from China. The beetle is considered a threat because its larvae are highly damaging to trees. Novel techniques used to control the outbreak, included the use of two detection dogs trained in Austria that can smell the beetles in trees. At the end of the first year’s survey, 1,500 trees had been felled and burned from fields and roadsides and 700 from commercial premises and private gardens. As of 2017/18 no further evidence of the beetle has been found. The town has two schools, Paddock Wood Primary School which was built in 1909, and which has approximately 600 pupils and Mascalls Academy (formerly Mascalls School), (a comprehensive secondary school), opened in 1956 and has around 1400 pupils, and it takes its pupils from Brenchley, Matfield, Capel, Five Oak Green, East Peckham, Horsmonden, Lamberhurst and Yalding, as well as Paddock Wood itself. Some Dickens scholars believe that Paddock Wood is the rural railway station described in Dombey and Son. ^ a b "Town population 2011". Neighbourhood Statistics. Office for National Statistics. Retrieved 25 September 2016. ^ "Your Councillors by Ward". Tunbridge Wells Borough Council. Retrieved 12 June 2011. ^ "The County of Kent (Electoral Changes) Order 2004" (PDF). Retrieved 12 June 2011. ^ "BBC News – Warehouse collapsing after fire". 5 July 2005. Retrieved 3 January 2010. ^ a b Walker, Jack (1985). Beginnings and Bygones of Old Paddock Wood. Paddock Wood, Kent: J C Walker. ^ "Paddock Wood Primary School – Our School". Archived from the original on 29 September 2007. ^ "Mascalls Academy About Us - Mascalls Academy".